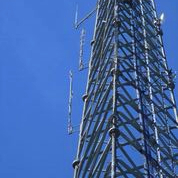 The 444.950 repeater is located in Prince Frederick,Maryland and covers an approximate 35 mile radius encompassing Calvert and surrounding counties. The repeater is a Yeasu DR-1X digital / analog repeater with an Arcom RC-210A controller. The link radios are Kenwood TK-880-3 transceivers configured as a 70 cm link.